Following the tragic ISIS-led carnage in Paris and Beirut, we now hear the cacophony of political opportunism and fear in which some politicians in the U.S. are actively working against America’s support of refugees, specifically Muslim refugees. 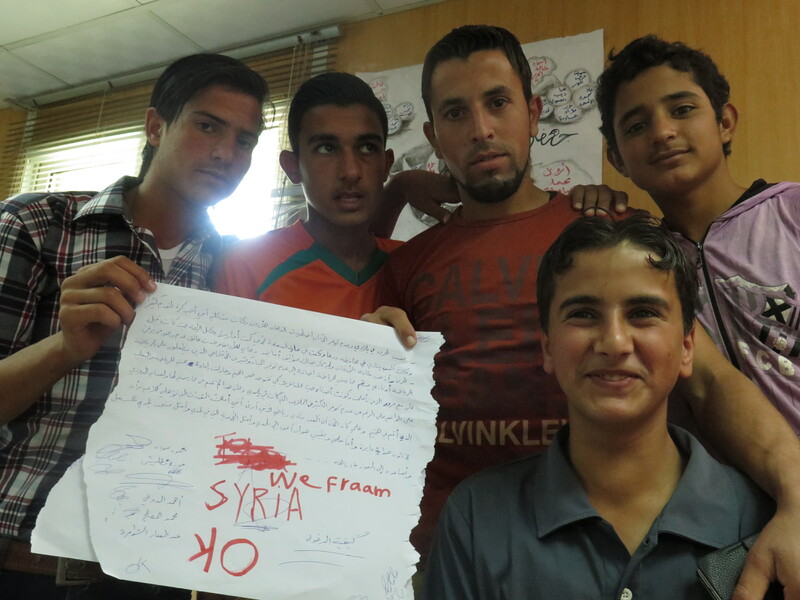 Just led my final ‪#‎MeWeSyria‬ communications workshop with the boys group in ‪the #‎Zaatari‬ refugee camp w/ Questscope. Some of the youth are bummed our program is almost over, but they are buzzing with excitement and confidence in the stories, messages and films we pulled together. 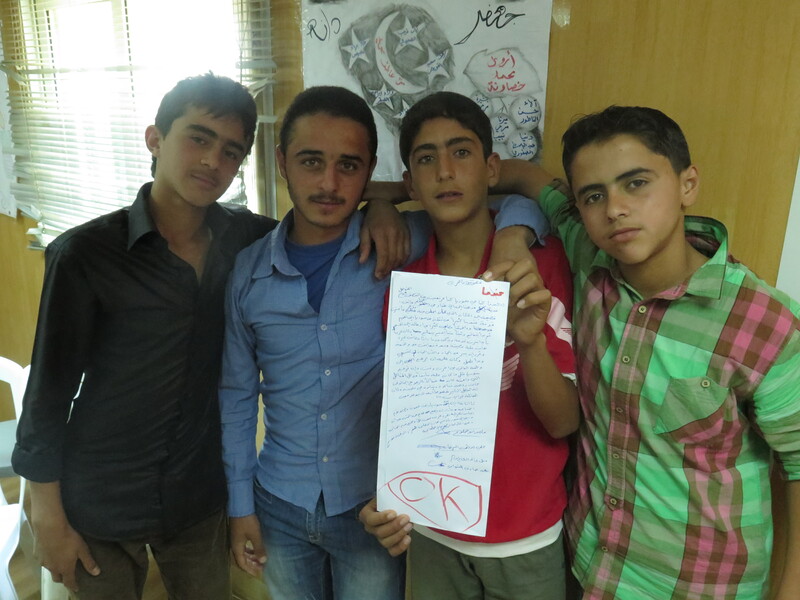 The‪#‎refugee‬ youth have taken brave steps in breaking mental walls for expression, communications & imagination over the last month. I am in awe of the resilience and love within these kids. I am so proud to have gotten to work with them. In total, the boys and girls groups have finished writing, directing and filming 6 short stories—each with key messages and lessons, and of course NO politics. While the politics of the world may fail their homeland, the youth of Syria will not fail our world. 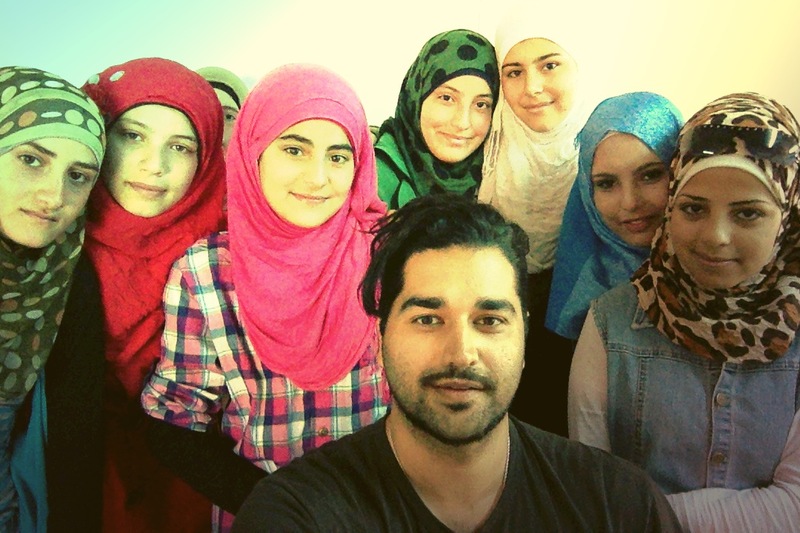 After three weeks of intense communications with the workshops with the Syrian refugee youth, I am happy to say that that the youth have started directed and filming their short stories. Above is a short highlight reel showing the some of the talents, smiles and hope being carried in the youth of Syria through the Me/We communications workshops. I cannot stress how much growth and progress we have fought for in recent weeks. There is much more work ahead of us as we continue filming and crafting stories with positive messages and lessons, as conceptualized by the refugee youth. I anticipate the momentum will continue. Plans are in place to put on an exhibition of the refugees’ messages at the Young Eyes Gallery in Amman from 17-24 June. I am trying to secure permissions for the refugees to leave the camps and attend. The youth have a deeper understanding about how important communciations is and they are realizing new avenues for self expression, critical thinning, team work, confidence and hope. None of the workshops or stories are political or religious in nature. This project is not about sides. It is about realizing the collective humanity to which we all equally belong. Skeptics may say this is just a cute project and no big deal. To them I paraphrase a Chinese proverb that says it is better to light a candle than to curse the darkness. We are empowering youth to light the candle for themselves, their communities and for our greater world. Our world may be failing them, but they will not fail our world. *Me/We has been funded by the German government and supported by the United Nations Alliance of Civilizations, and by the dedicated local staff and coordinators working in Zaatari refugee camp and Zarqa: Questscope and Family Guidance Awareness Center. 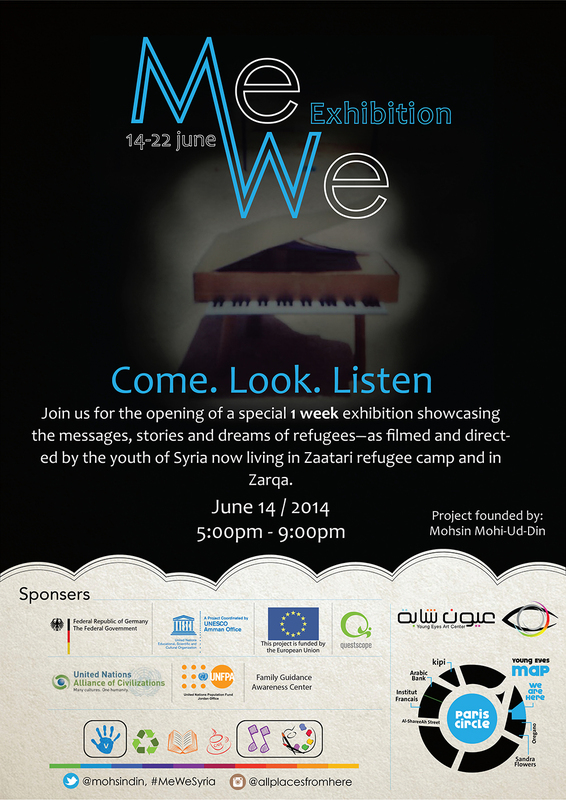 Zaatari workshops are hosted by the local NGO, Questscope—funded by the EU and UNESCO, OCHA. Support Questscope’s important and successful mentoring programs for refugee youth here: http://www.questscope.org. Logistical support provided by UNFPA. Zarqa workshops are hosted by the Family Guidance Awareness Center, FGAC. Volunteers and coordinators making Me/We a success: Manal Jbhour, Khaled Jbhour, Young Eyes Center (Khaled and Issa), Manahil and Abdur Rahman (FGAC), Nadeen and Ashraf (Questscope), Dareen (UNFPA). Me/We workshops founded by Mohsin Mohi Ud Din (UNAOC Fellow and Fulbright Scholar alum). Zaatari is not a zoo. Zaatari is not a gateway for NGOs to just have something to do or to get funding. It is not a badge of honor or a cool social media post. It is a temporary home for many who do not want to be there. It is an ocean of white tents sheltering over 100,000 families from the angry sun. It is rocks and dust of a country not their own. The Syrian people here are enduring loss, a permanent state of loss. We all know that, sure. But perhaps we are desensitized to the rubble that piles each day as the world continues to fail the women and children of Syria. 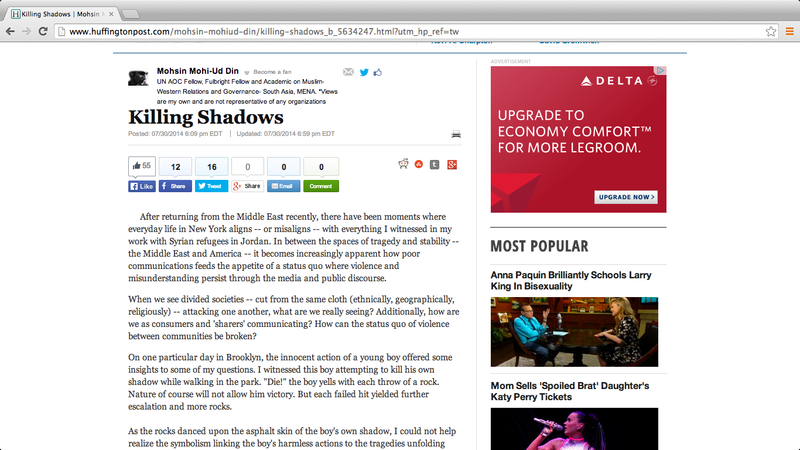 Even so, what is remarkable about Zaatari is not its scale…its stories of loss. What is remarkable is the resilience of the human spirit of the Syrian mothers, fathers, boys and girls and youth. I witness this each day as I continue with the communications/arts workshops for the youth. In its third week, the workshops are now moving to the challenging phase of pulling story ideas for films that are to be directed and filmed by the youth in Zaatari. In both the boys and girls group, the concept of sharing a story idea and using the imagination to cultivate a positive end is confusing. Some were even frustrated by the exercise. “Think of an ending as you wish to it to be, not as it is expected to be,” I tell them. They struggled with this question. “Imagination? What does that mean?” I point to the light bulb in the room. “The people who discovered electricity and invented light were crazy enough to imagine something new. Before this, there was dark. The internet? Even crazier. Now we are all connected.” Imagination fuels creativity, innovation, and ultimately a world that rises above the walls and barriers of body and mind. 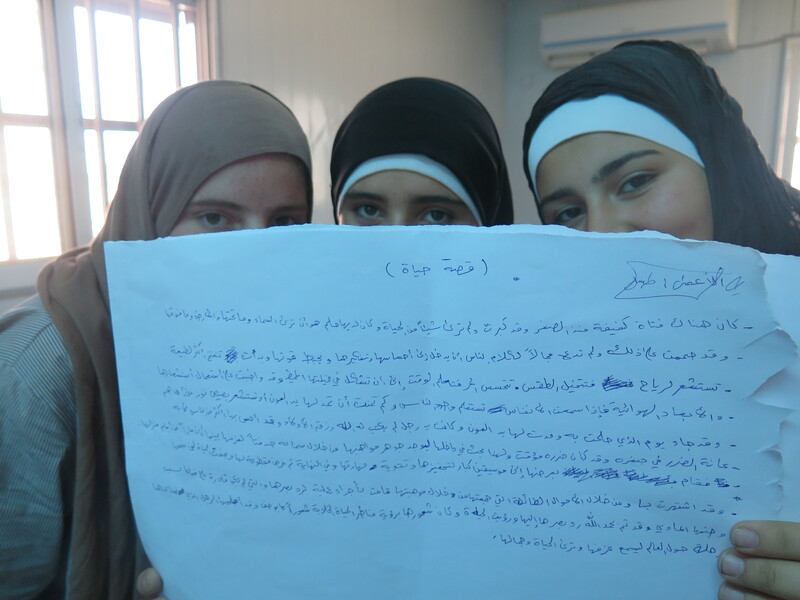 With patience and a bit of pushing, both groups in Zaatari came up with four story ideas for filming this week. All it takes is one spark, one idea. Blank papers and confused eyes then give way to ink on paper and energetic collaboration. A rich boy mistreats a poor boy in need. The poor boy struggles in life, but ends up being sponsored by a man who helps him get an education and a job. Later in life, the poor boy becomes rich and sees that the other rich boy is now poor. The lesson: treat every one equally and with respect, because one who is rich can just as easily become poor. The story is also about forgiveness. This was a particularly interesting group because I asked the girls why they chose a male lead character. “How can a Muslim girl have a job and live all alone?,” they asked. We challenged this concept by saying the story should not be restricted to cultural conventions if they do not want it to be. They are now debating which route to take. The other group of girls came up with a story about how a blind girl is mistreated and discriminated against. 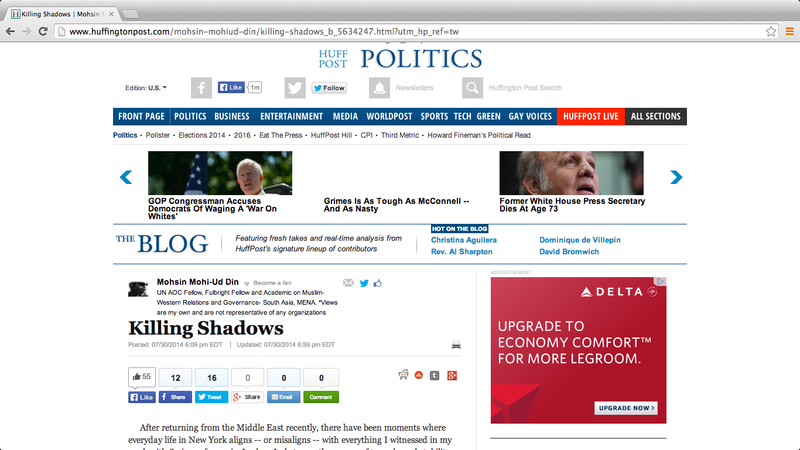 They chose to do a story on blindness because it is a problem they noticed a lot in Syria. The protagonist does not give up in the face of ridicule and ends up becoming a world famous composer, earning enough money to get an eye operation that allows her to see. – A group of talented soccer players are forced from Syria due to war and violence. They end up in Zaatari where they can only play on rocks and desert. They are so talented though that they become the local soccer champions of Zaatari. They are at risk of giving up soccer because there is no safe field to play on and a persistent lack of water. Upon a visit from the Jordanian national soccer team, the Zaatari team challenges the national team’s coach to a charity match. If the Zaatari team wins, the Jordanian team will build a proper soccer facility for the youth in Zaatari. The story will end with the boys back in Syria, playing for the national team. – The other boys group developed a story about an uncle who loses one of his legs from a bomb blast in Syria. In Zaatari, he is not able to afford a prosthetic leg. He dreams of walking again but those around him do not support his dreams. He then has an idea of how to build his own prosthetic and ends up back in Syria teaching others how to make their own, and how to walk again. 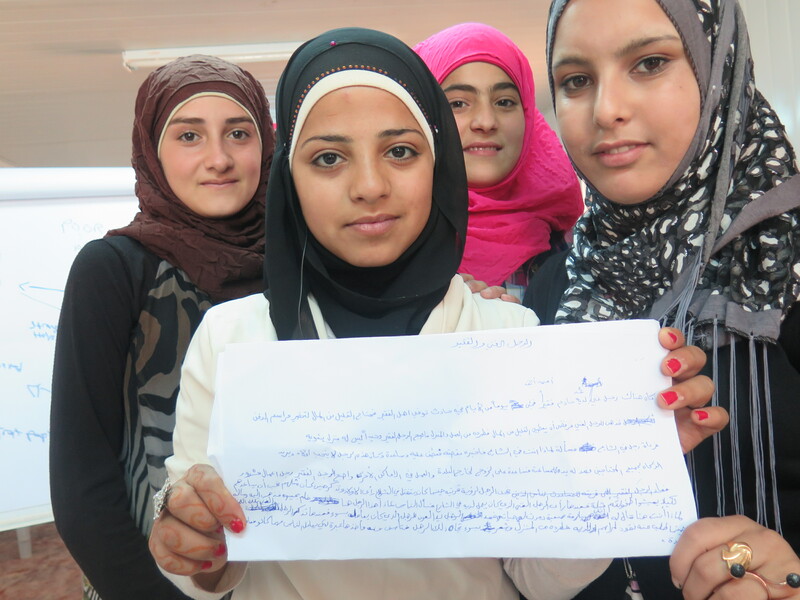 Sufficed to say, I am in awe of the human spirit within the Syrian youth. 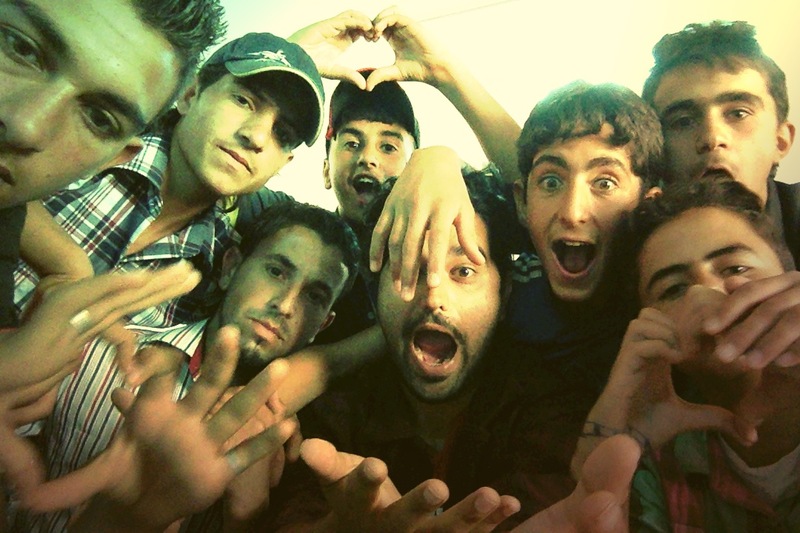 In the next few weeks I will lead these groups in directing and filming each short story in Zaatari. The challenge will be how to film all the scenes inside the compound of Zaatari. As I understand it, it will not be safe to travel outside the caravan with cameras. Stay tuned and follow our progress. I am also teaming up with a local gallery called Young Eyes to put on a exhibition and screening of the youth’s work. * These workshops would not be possible without the support of the staff of Questscope, who are leading mentoring programs and youth education programs inside Zaatari. Learn more about how to support Questscope here. *This project is my own independent initiative known as the Me/We Initiative. Project support for Jordan has come from the German government, the United Nations Alliance of Civilizations and UNFPA.